The announcement that David Hope is to be the next Archbishop of York should have been greeted by predictable caricature reactions. Liberals should have been crying in their beer. In the event it was left to a few of the barmier feminists to vent a rather mild public spleen. Most recognise that Hope had been passing fair in his appointments of their people and unfailingly courteous and pastoral to those women with whose ordination he was doctrinally out of sympathy. Catholics should have been dancing in the streets. instead they were quietly welcoming to a man of whom they are very fond while still waiting to see if he can or will do much to restore orthodoxy to Anglicanism. Evangelicals in London who ought to be out of sympathy with the elevation of an anglo-catholic, were disappointed to be losing a man they have come to recognise as a serious institutional reformer and a man whose odd ritualistic practices are more than compensated for by a passionate readiness to talk about Jesus. It was on a late May evening that New Directions caught up with Bishop Hope at his London home. The Barton Street residence is in the corner of an L-shaped street tucked between Faith House and Parliament. The rooms are simple, functional and clearly the domain of an unfussy bachelor whose life and work are hard to separate. It was at the end of another very long day – a major evening discussion on the Church in the City at St Lawrence Jewry at one extreme and a day spent in the Scrubs working with Roman Catholic colleagues. Hope, himself, volunteers none of this and is warm, welcoming and attentive as any good parish priest making you feel you are the only one concern he has in the world. We begin with prayer – and this is no perfunctory offering – I begin to see why he cuts the mustard with evangelicals. But his beginnings? Where and when and how? His Dad was a builder in grandad’s firm George Hope and Sons, in Wakefield. Builders and architects are often astonished to find a clergyman with whom they can have a serious technical conversation. “Oh a Latin master, a chaplain. Took boys to Rome, Assisi, Walsingham – all totally innocent but unthinkable now – he influenced a long line of young men. And a Methodist lay preacher – Maths master – I was ruinous at Maths but his great care always impressed me. Of course religious were part of our lives – northern catholicism was the C of E for me. Nuns and monks came and went – the church was completely incarnational, a normal part of life. “I was 12. I asked God to make me a good and clever boy! I can still remember the list of sins for my first confession.” Any improvement? “Well I could be quite tempestuous and impossible at times. I think God’s grace has moderated it don’t you?” This is a question to his chaplain who is passing through. The only response is a merry chuckle. “I wanted to be a train driver”. This is a serious conversation stopper! So when did you become aware of vocation to the priesthood? Bishop David read theology at Nottingham before going on to St Stephen’s House, a place where he was later to become a legend. Here like all theology graduates he would push on deeper. “I studied Cyprian of Carthage and later the Verona Sacramentary and formative liturgies” He went to study in Paris, Verona and the Vatican. Here, and later when he talks about his time in the orthodox east, he reveals an excitement about worship, the language moving from prayer book to Latin to the profound experience of “liturgy as dialogue between heaven and earth” – ” angels and archangels” – “the door opening into eternity”. “the transfiguration and transformation” “the earthy natural business of the incarnation and the glimpse of our eternal destiny” There is nothing pi about this – he is describing a reality for him (and us). David Hope is excited by worship. For those who want to know his episcopal model – a brief tour through Cyprian in a traditional patrology will give some clear indicators and predictions – baptism, penance, unity, collegiality, morality, charity – it’s all there . Where did you serve your title? St John’s, Tuebrook. ” A bit up the candle for me but I was at the disposal of the church.” (this is a recurring theme). “One room digs, a bike, £500p.a., no phone and David Diamond as Senior Curate. Two years square bashing including fortnights of crem duty where you had 20 minutes to speak a word of life and hope eight or ten times a day. A far cry from my experience of death where Grandma was laid out in the front room and we had time to mourn. From there to Bucharest as chaplain. Living in the house of a Uniate priest under the eye of the Securitate and witnessing great deprivation. Saying Mass and taking Bible study, Zagreb, Belgrade, Sofia. “They were formative times”. Then back for two more years at Tuebrook before going on to “the happiest days of my life” – Vicar of Orford in Warrington. “I was pressured to take it over and it was not the place I knew. There was a great need for sobriety and simplicity.” This is Hope code for sorting out spiritual carelessness and moral turpitude of legendary proportions. Was the story of him putting one-way train tickets in student’s pigeon holes true? “Yes, a few”. There is no false pride in this – just a sense of duty and necessity and that bit of steel required of leadership. It was under Hope that finances were saved from chaos – the great move to Marston Street effected and relations with Wycliffe Hall developed. It was a vast work and not immediately appreciated vision which has continued to bear fruit in many lives. His hopes for a Pusey pastoral fellow and further education fellow were, sadly, not realised. How does he regard training now? And so to Wakefield, the missionary diocese – home! It is a small but significant note, gleaned from another source, that Hope was in audience with the Queen one day and standing in his shirtsleeves, an anonymous member of the crowd in the Mall the next day – VE Day. When the ordination of women went through he could have opted for a no-go area in London. he didn’t. Why not? It is difficult to think of an inspiring episcopal leader at the moment, is that fair comment? There is a detectable pause, then a smile. “It’s true the great characters are missing and that’s probably down to the appointment system. We need to regain that indomitable zeal for winning souls for Christ, a firm commitment, not sparing ourselves, we need to proclaim Christ in the sacrament of the altar, be fervent in prayer and draw people by a worship that is converting. Will any orthodox leaders be appointed Bishops? And then will the PEV’s be phased out? “No. They will continue regardless. They have a vital role and are not just one issue bishops. We have been constantly told that there are no orthodox candidates of sufficient quality for bishops. Is that your experience? What do you say to priests considering Rome? Recently the courts ruled that the church was no longer historically “by law established” but could be changed, even doctrinally, by Synod. Do we have a duty to overturn this? 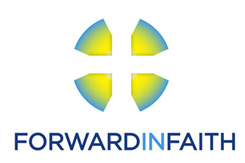 How do you regard those wicked people at Forward in Faith? “Your words – not mine! It is a very diffuse organisation and I have considerable sympathies with them. I think there is a need for that network and solidarity to feed and lead the people. It mustn’t be one issue though. It ought to be encouraging a rule of life and enabling people to grow in the faith of Jesus and witness to Him”. Why have you never taken the lead? Peter Tatchell pursued you with innuendo and, by common consent you saw him off by taking a very courageous decision. Anyone in Fleet Street knows that you don’t do what Hope did unless you are an insane gambler or absolutely clean. The quiet admiration of the press after exhaustive enquiries is a clear indication of their verdict. It is easy to see why the evangelicals have taken to him and why, if he is prepared to pick up that great groundswell in the Northern province he might just be the last hope of staunching the orthodox haemorrhage in the Church of England.